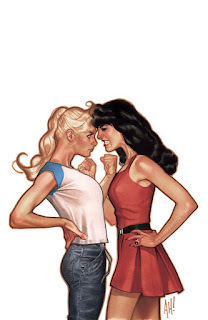 There are few pairings that better define the term "frenemies" than Betty and Veronica. The two of them have been in a pitched battle against one another with plenty of stakes on the line. Best friends. Bitter rivals. The posh socialite and the girl next door — two of the most iconic characters in pop culture — are slated to make a big return this July 20 in Betty and Veronica #1 with comics legend Adam Hughes taking on the creative duties. And it will feature variant covers from some of the industry’s hottest talent and rising stars including Stephanie Buscema, Cliff Chiang, Veronica Fish, Francesco Francavilla, Chip Zdarsky and more. As Riverdale’s most beloved blonde and brunette find themselves divided over the takeover of the town’s central hangout, Pop’s Chocklit Shoppe, battle lines are drawn and friends have become enemies as the town is enveloped in all-out civil war! Oh, and there will be jokes. Plenty of jokes. “Pops’ Chocklit Shoppe is being taken over by a huge coffee company. When Betty and Veronica go head-to-head over the issue, all bets are off! Friendships will shatter. Cities will burn. Nails will be broken. Variant Covers: Stephanie Buscema, Cliff Chiang, Veronica Fish, Francesco Francavilla, Chip Zdarsky, and more!